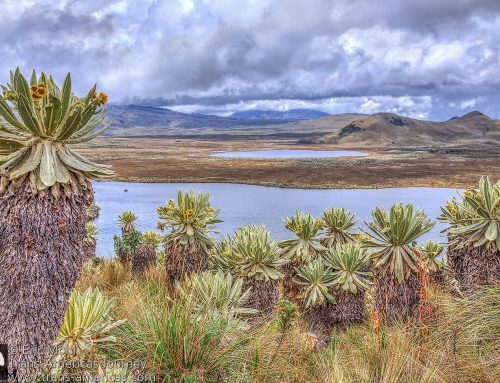 Most travelers don’t spend any time in Guayaquil, Ecuador unless they’re flying to the Galapagos Islands from this city instead of from Quito. We, on the other hand, travel everywhere and we visited Guayaquil twice. 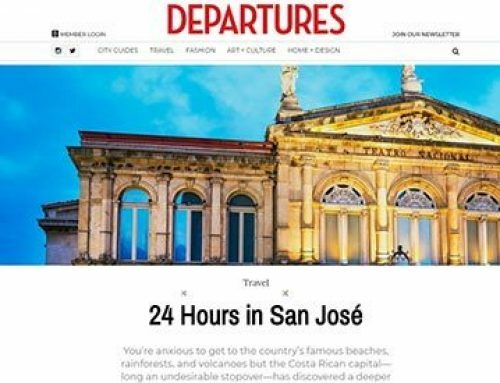 Use our city travel guide to tell you what to do, where to eat, and where to sleep if you find yourself in Guayaquil. 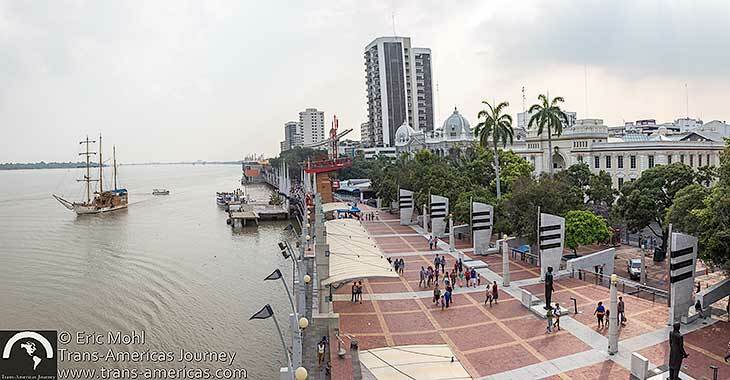 The Malecon 2000 walkway along the Guayas River in Guayaquil, Ecuador. 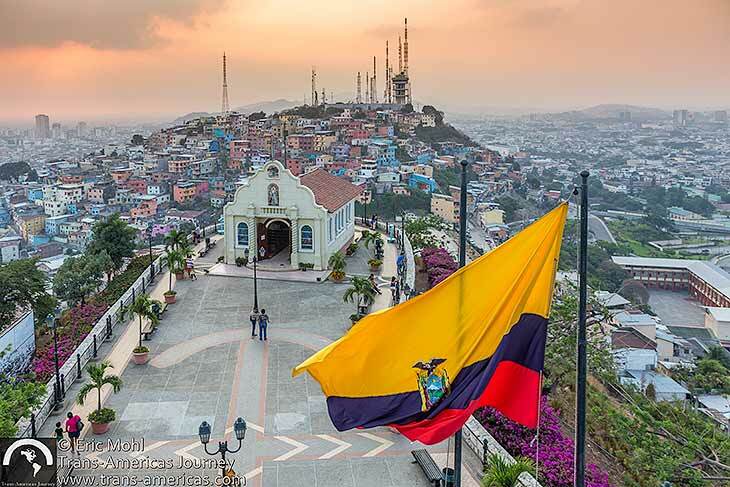 Guayaquil is a hot, riverside metropolis and the second largest city in the country. 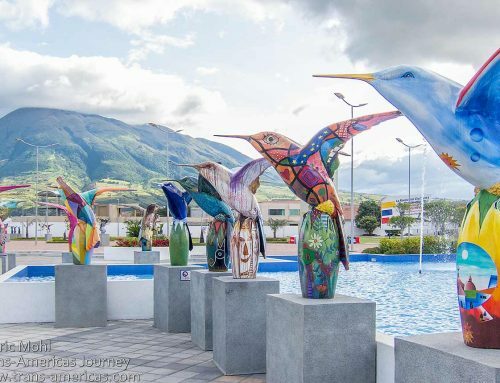 The city, which feels like it’s perpetually on the cusp of a comeback, sits on the Mississippi-like Guayas River which pirates and Peruvians used to invade and occupy the city. 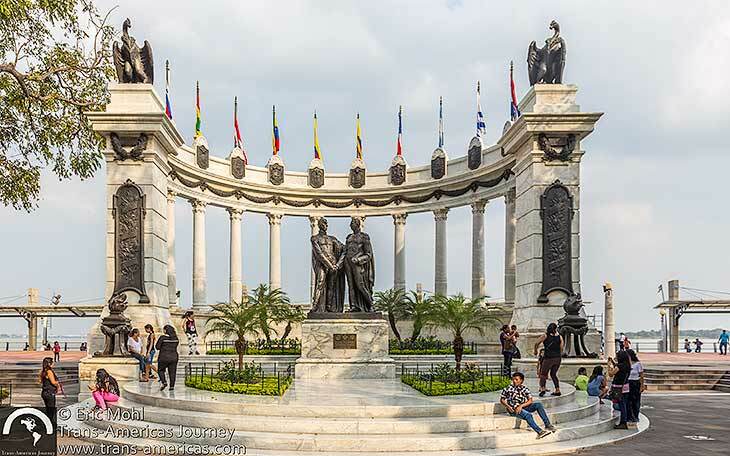 This statue commemorating Simon Bolivar and Antonio Jose de Sucre is part of the malecon in Guayaquil. The pleasant and lively Malecon Simon Bolivar, aka Malecon 2000, runs along the river and it’s a good place to stroll. It’s breezy (read less sweltering) and there are plenty of shady places to sit and watch the river and city residents go by. Santay Island in the Guayas River is surrounded by mangroves and inhabited by just a few families. This island offers a few trails, bird watching (about 85 species have been spotted here), a crocodile facility, and restaurants. A few of the historic buildings which were moved to Heritage Park where they were restored and can now be toured. 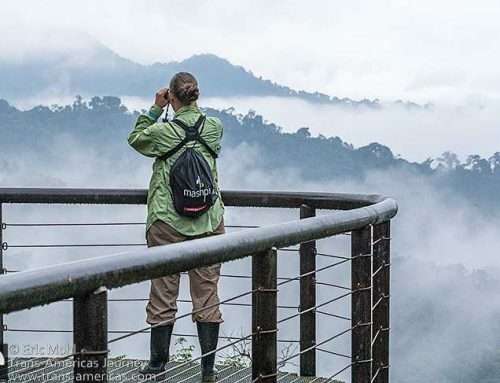 At the 20 acre (8 hectare) Heritage Park (called Parque Historico in Spanish), on the banks of the Guayas River, you can stroll through lush green spaces (wear bug repellent) past enclosures containing a Harpy eagle, tapir, ocelots, monkeys, and tropical birds. You can also tour historic buildings which were moved from their original locations and rebuilt and preserved in the park. Amazing pottery in the Museo Presley Norton in Guayaquil. 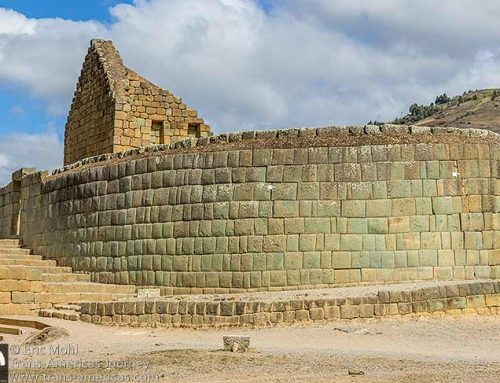 The three-level Museo Nahim Isais (free) has more than 2,500 pieces of religious art in its permanent collection and hosts rotating exhibits. 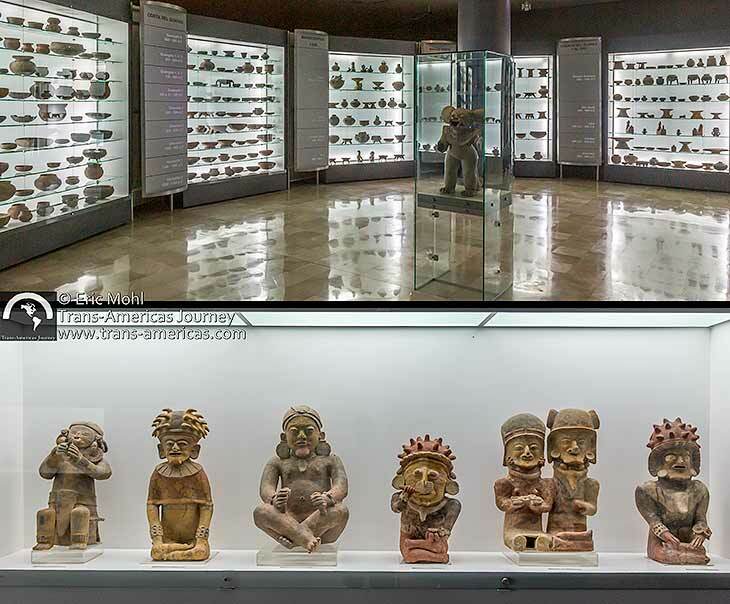 Located in the home of the founder of Ecuador’s El Universo newspaper and named after archeologist Presley Norton Yoder, Museo Presley Norton (free) has more than 8,000 archaeological pieces dating back to 400 BC. The pottery collection is remarkable. The best architecture is found in the Las Peñas neighborhood of Guayaquil. Guayaquil has been ravaged by fire and by earthquakes, so there is very little noteworthy architecture left in the city except in the Las Peñas area on Santa Ana Hill. 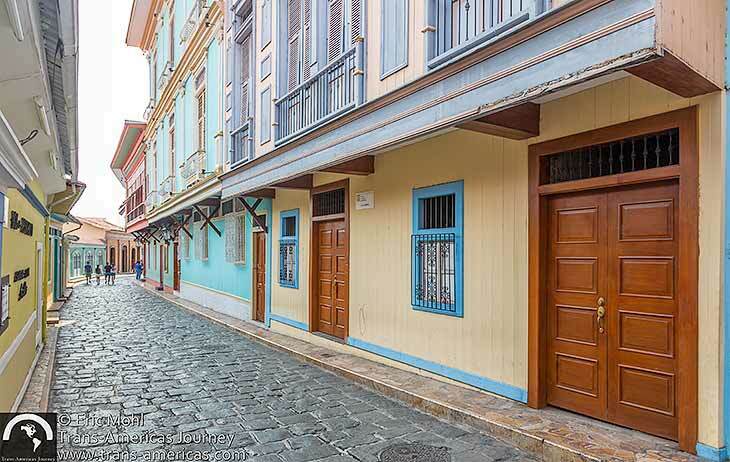 This is the birthplace of Guayaquil and you can still see cobblestone streets and 400-year-old architecture in Las Peñas because some buildings there were spared from fires and quakes that ruined other areas of the city. 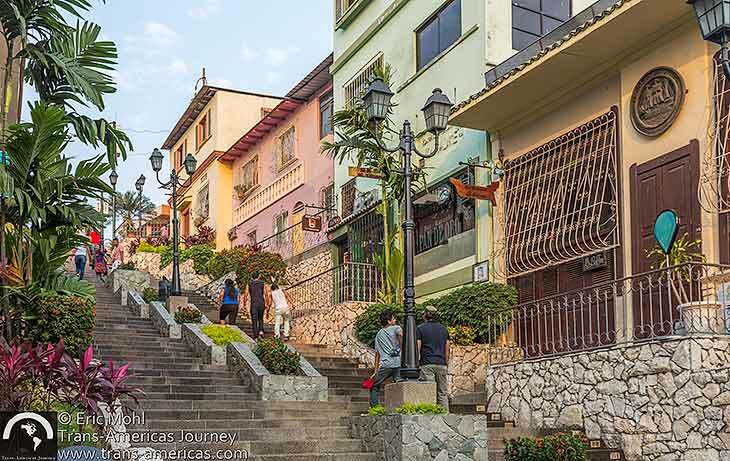 This staircase climbs up to the Las Peñas neighborhood, then on to the top of Santa Ana Hill. 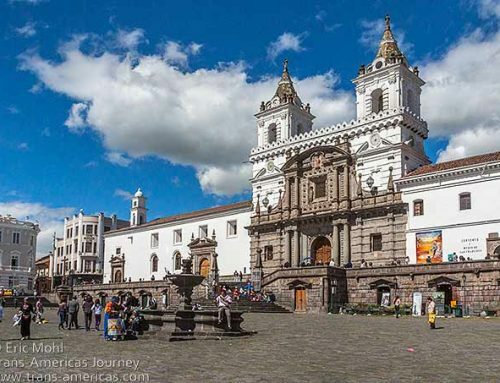 Las Peñas was originally inhabited by fishermen who were willing to walk up the hill, but the area gentrified and became home to former Ecuadorean presidents. Ernest Hemmingway spent time there and Che Guevarra did volunteer medical work in the neighborhood. A small chapel, a lighthouse, and views over the city reward those who ascend more than 400 steps to the top of Santa Ana Hill above the Las Peñas neighborhood. 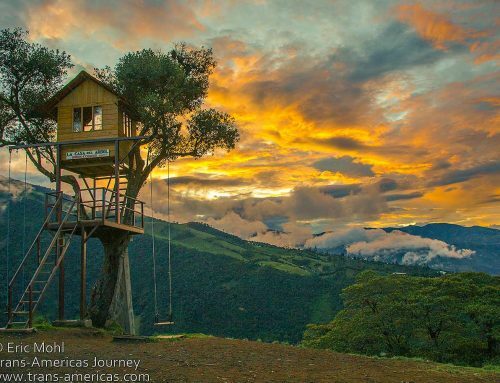 Keep ascending the 465 steps past Las Peñas to reach a hilltop lighthouse and enjoy great views over the river. 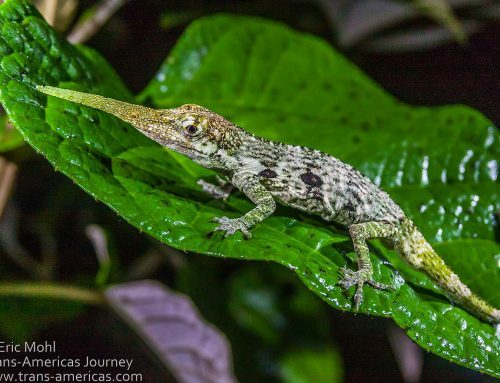 Just a few of the critters you’ll meet in Parque Seminario (aka Iguanas Park) in Guayaquil. 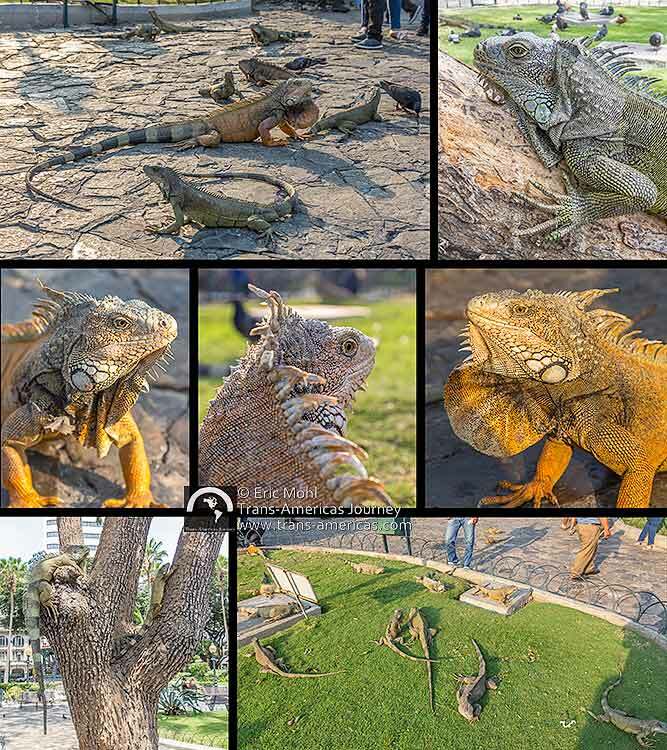 If you want to hang out with a lot of disturbingly tame iguanas (some up to 5 feet or 1.5 meters long), head to Parque Seminario (aka Iguanas Park). 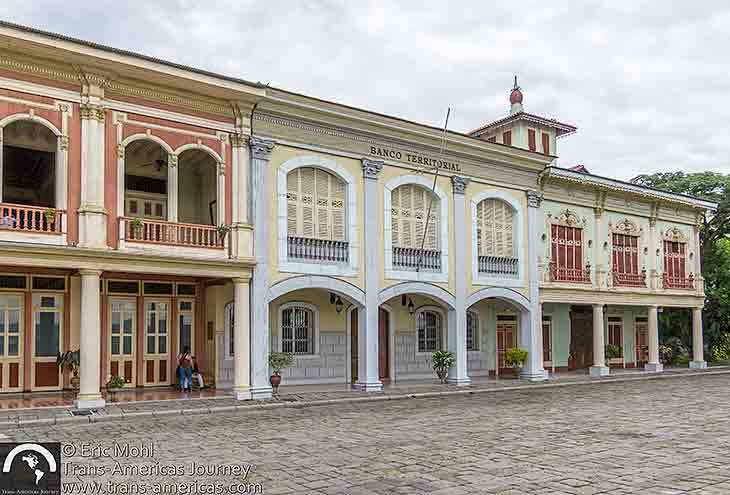 Just a few buildings have survived decades of fires and earthquakes in Guayaquil. El Primo (on the corner of Rocafuerte and Mindiburu streets, open 10 am to 7 pm every day) does not look like much. It’s just a round, closet-sized kiosk plunked down on the sidewalk. However, this is where proprietor El Primo (primo means cousin in Spanish) has been making one of Ecuador’s best sanduches de pernil (pork leg sandwiches) for the past 20 years. For less than US$2 you get a sandwich made on a yucca bread roll (like a denser, smaller sub roll) packed with hand sliced roasted pork leg (marinated in yogurt for extra moistness), pickled onion, and chopped iceberg lettuce topped with some chicharron pork crackling and, if you like, a few drops of (careful!) a fiery homemade pepper sauce all moistened with a spoonful of hot pork drippings. 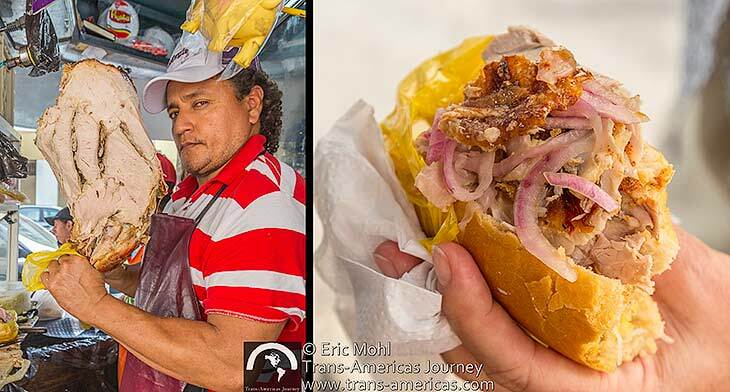 El Primo (left) and his legendary pork sandwich. 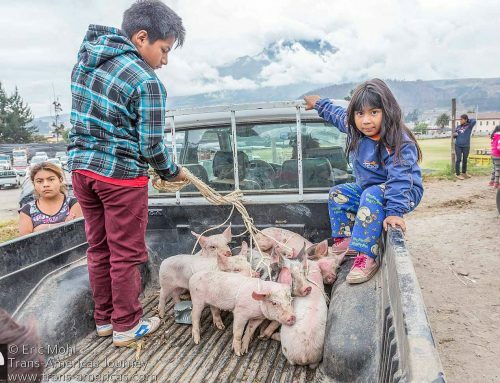 El Primo (pictured above) told us he goes through seven huge pork legs a day to satisfy a constant crowd of customers. Sushi Isao, opened in 2013, is Japanese-owned and the local sushi chefs were trained by a Japanese chef before he died. When we were there, the place was packed. The owners admit that the sushi rice is a little sweeter, to appeal to the local palette. 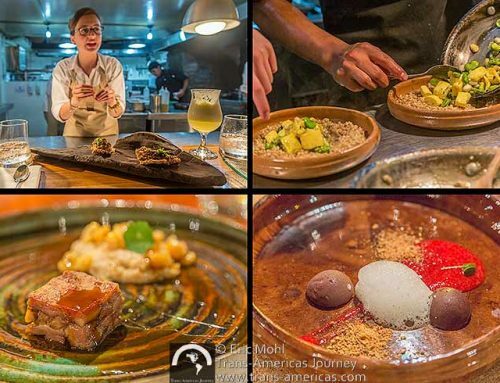 The most popular dish is a ceviche and tempura roll which they claim they created. It’s delicious. For delicious pastries and other baked goods, head to Mono Goloso. And the Las Peñas neighborhood has a lot of bars. Many are only open on weekends. Mansion del Rio Boutique Hotel in Guayaquil. The most historic hotel in Guayaquil is Mansion del Rio Boutique Hotel. 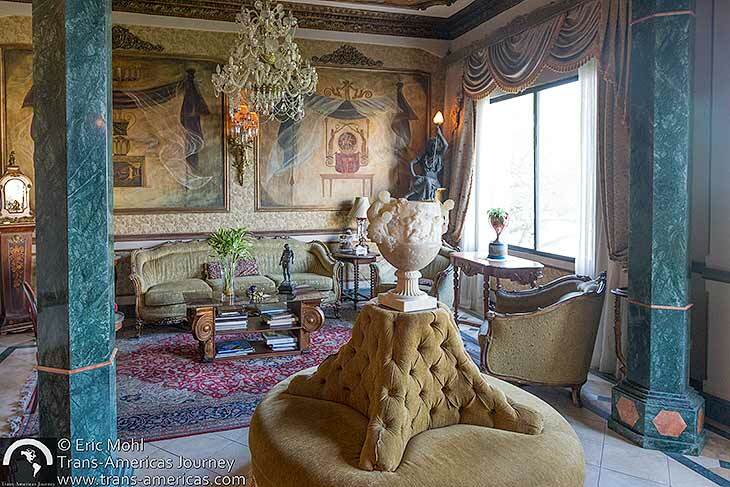 Located in the Las Peñas neighborhood, this lavish home was built in 1926 in concrete and stone, so when fires destroyed the city it survived. Today, it’s one of the most historic and architecturally unusual buildings in the city. 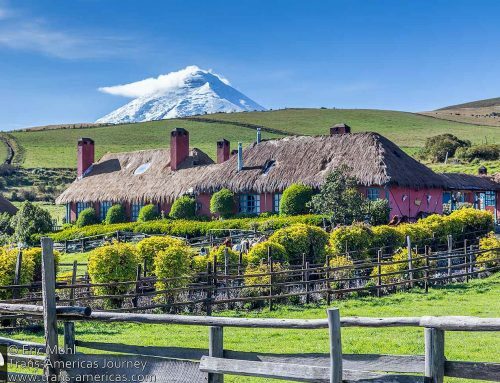 The mansion was opened as a hotel in 2010 after a six-year renovation which restored original crystal chandeliers, stained glass windows, rugs, saint statues, and amazing wall and ceiling paintings on canvas that were created in Europe and sent to Ecuador. The whole place is filled with antiques and the 12 room hotel has the look and feel of a place that time forgot. 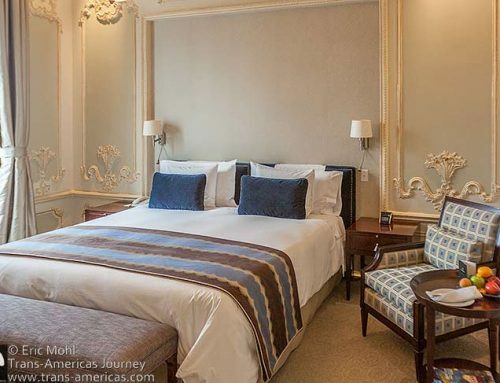 Rooms #1 and #2 are particularly atmospheric and original and have great views of the Guayas River. Don’t be put off by the uninspired circa 1973 facade of the Hotel Oro Verde. Inside you’re going to find a solid and even stylish hotel for business travelers and for leisure travelers who want great Wi-Fi, extremely comfortable rooms, a pool, a gym, and an extensive breakfast buffet. 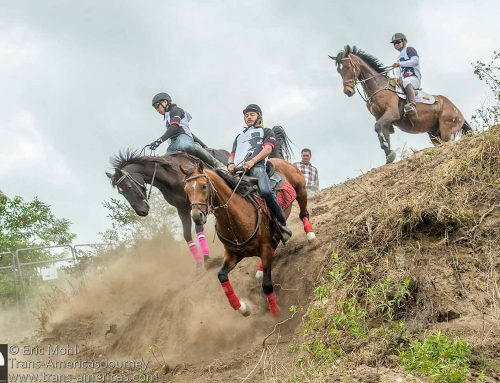 Since our last visit to Guayaquil, the owners of the Oro Verde have opened the Hotel del Parque boutique hotel as well and we hear good things. 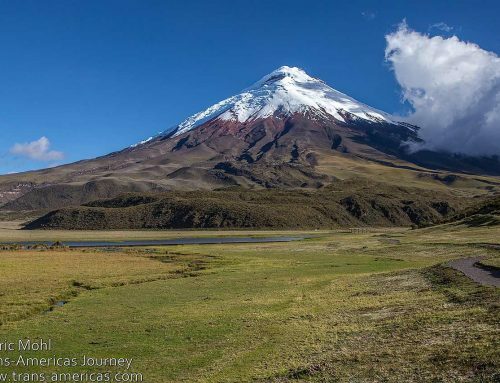 If you need an airport hotel before or after that flight to the Galapagos, check out DC Suites where about US$40 got us a very clean private double room with air conditioning, cable TV, lots of space, and transfers to the airport. Don’t be put off by the alley location and the garage-like check-in area. 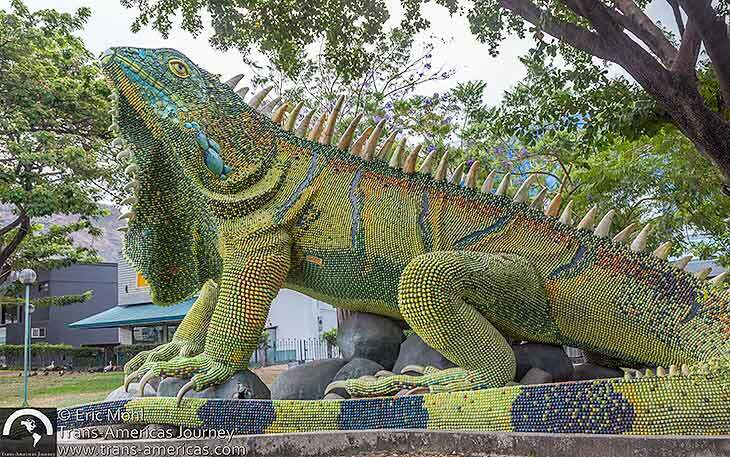 The iguana is the symbol of Guayaquil and this massive tiled monster is a great example of the city’s mascot. The iguana is the symbol of the city of Guayaquil, which explains that massive tiled monster pictured above. Animator Mike Judge (Beavis & Butthead, King of the Hill) and rapper Gerardo Mejia (he of “Rico Suave” fame) were both born in Guayaquil. 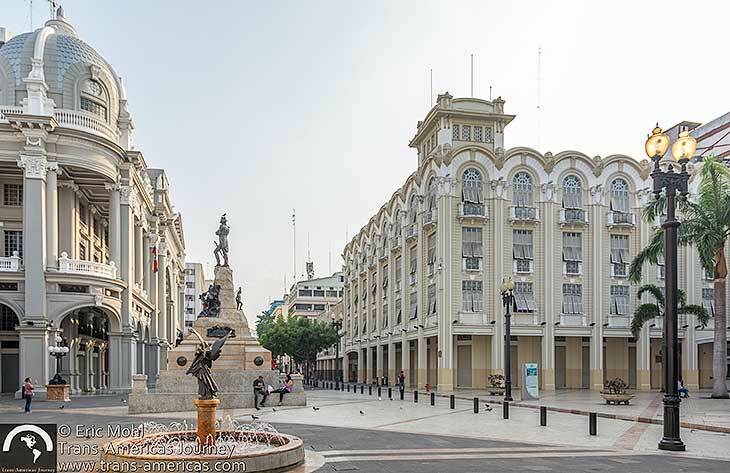 And the malecon in Guayaquil was overhauled and improved with planning and design expertise from our friend Mario.